Streambank lupine is a native coastal lupine species found in North America along the Pacific Coast, from California north to southwestern British Columbia (USDA 2010). It is found in disturbed sandy-gravelly sites at lower elevations (lowland zone in BC) (Douglas et al. 1998; Hitchcock and Cronquist 1973; Riggins and Sholars 1993; Sholars 2009 pers. comm. ), including gravelly prairies, riverbanks and open woods (Hitchcock and Cronquist 1973). It was first reported from British Columbia in 1926, where it was collected by Anderson along the lower Sooke River on Vancouver Island. Populations have now been found in the Lower Mainland, in Coquitlam, Delta, Richmond and Surrey. Perennial herb from a branched, somewhat woody stem-base that persists through the winter; stems several, decumbent to ascending, 40-60 cm long/tall, hollow, glabrous or slightly hairy. Alternate, palmately compound; leaflets 6 to 9, narrowly oblanceolate, rounded to blunt with an abrupt point at the tip, glabrous above, thinly hairy below, 2.5-5 cm long, the leaf stalks from shorter than to as long as the leaflets. Inflorescence a terminal raceme of several well-separated whorls of pea-like flowers, the racemes 12-25 cm long on stalks 5-9 cm long; corollas blue-purple to lavender, whitish near the base, 12-16 mm long, the banner circular and glabrous, about the same length as the glabrous wings and the keel, which is fringed with hairs along the upper edges; calyces with swollen base above, about equally 2-lipped, the upper lip 2-toothed, the lower lip boat-shaped, entire to slightly toothed. Pods, to 5 cm long, minutely hairy; seeds 6 to 10, greyish with dark mottling. Wet to moist meadows and riverbanks in the lowland zone; rare on S Vancouver Island and in the lower Fraser Valley; S to N CA. There are several native lupine species as well as hybrid plants obtained from seed packages or garden stock that could be mistaken for Lupinus rivularis. In B.C., likely look-alikes include L. littoralis (sea shore lupine), L. arcticus (arctic lupine), and L. arboreus (yellow bush lupine). L. littoralis is a coastal sand dune species. It is not restricted to riverbanks. It sports long, silky hairs and has a very different habit from L. rivularis - i.e., it is more sprawling and is not bouquet-like. L. arcticus looks very similar to L. rivularis but is not restricted to streambanks. It is found at higher elevations. The blue-flowered form of L. arboreus is readily separated from L. rivularis by being a more woody plant with leaves that fold quickly, fan-like, upon picking. It intergrades elsewhere in its range with L. rivualris where the two have hybridized. Heights for L. arboreus surpass that of L. rivularis, with plants often 1.8 to 2.4 m tall. 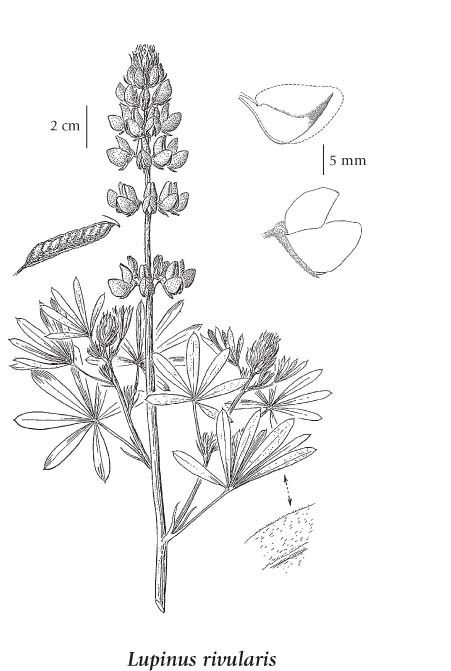 L. polyphyllus (large-leaved lupine) x L. rivularis x L. arboreus hybrids can be confusing. Distinguishing features are the presence/absence of basal leaves, leaf-folding behaviour, and occurrence at higher elevations or away from streambanks. Lupinus lasiotropis Greene ex Eastw. Lupinus latifolius var. ligulatus (Greene) C.P. Sm. Lupinus rivularis var. latifolius (Lindl. ex J. Agardh) Jeps. Douglas, G.W., G.B. Straley, D.V. Meidinger, and J. Pojar (editors). 1998. Illustrated Flora of British Columbia. Volume 2: Dicotyledons (Balsaminaceae Through Cucurbitaceae). B.C. Ministry of Environment, Lands & Parks and B.C. Ministry of Forests. Victoria. Hitchcock, C. Leo and Arthur Cronquist. 1973. Flora of the Pacific Northwest. University of Washington Press, Seattle. Riggins and Sholars. Lupinus rivularis. In: Hickman, James C. The Jepson Manual of the Higher Plants of California. University of California Press, Los Angeles. Sholars, Teresa. 2003, 2009. Personal communication. E-mails and telephone conversations. USDA. 2010. Plant profile for Lupinus rivularis. United States Department of Agriculture Plants Database. Available Online.